Summer! The season for weddings is upon us and it can get expensive! 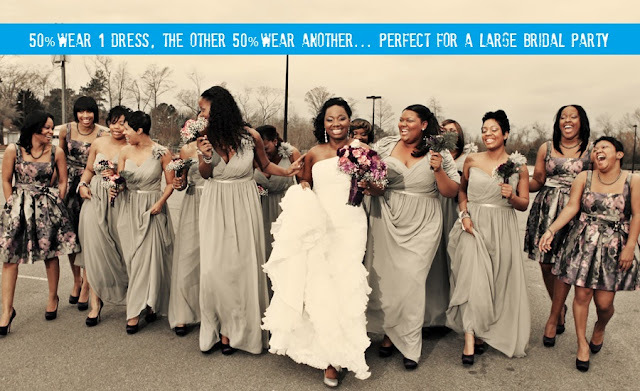 If you are lucky enough to be chosen as a bridesmaid, get ready to incur a mountain of expenses... bachelorette party, hair, nails, makeup, matching shoes and accessories, spa packages, travel costs, the list goes on and on. While some brides are considerate of their friend's financial situations, others expect bridesmaids to cash out their savings in preparation for that special day. Of course there are costs that a bridesmaid can escape, but the bridesmaid dress is simply not one of them. Bridesmaids are often asked to drop a pretty penny on a dress they don't even like and will never wear again. 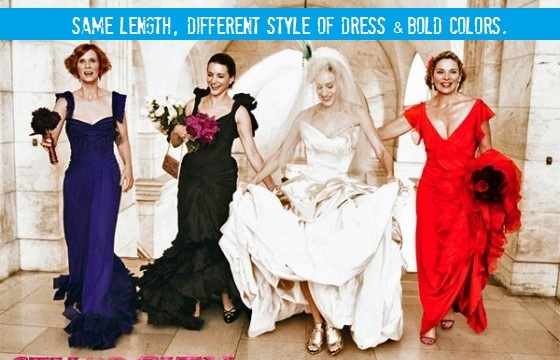 So, Bon Vivant and a Budget presents the perfect solution for everyone... mismatched bridesmaid dresses. 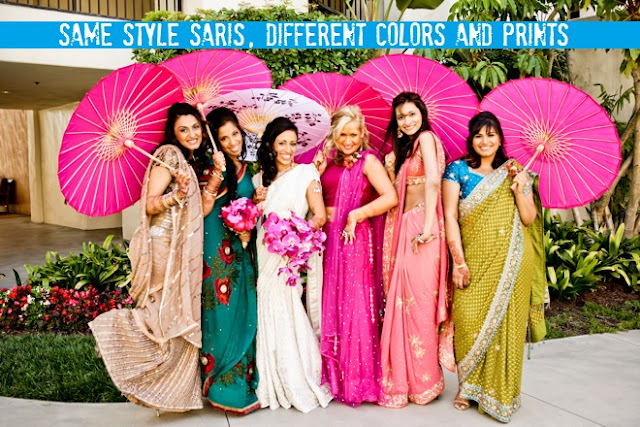 Equipped with a set of guidelines from the bride, each bridesmaid picks out her own dress. This ensures bridesmaids like what they wear (it's flattering for their body types and styles) and only have to spend what they can afford. Most of all, the bride is happy because her beautiful wedding now has a unique flair. 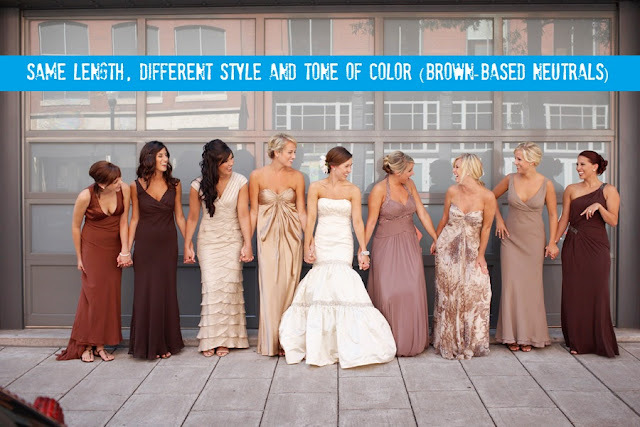 Do you like the look of mismatched bridesmaid dresses? 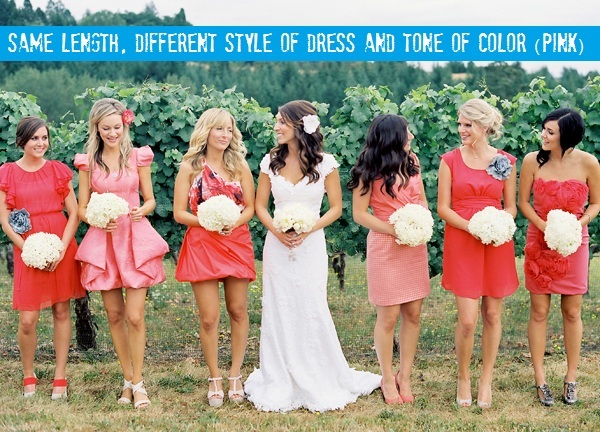 Would you consider mismatched bridesmaid dresses for your own wedding one day? Leave your comments below. i love this! what a great idea. love the guidelines you have for it. really ties it together. I am actually in two weddings that chose to go with this concept in different ways! The closest one (August) is a 3-day, 2-ceremony ordeal, so we will have matching saris as well as short silver/grey dresses. The second is in October, and the bride chose a floor-length "transformer" dress so that we could all wear ours in whichever wrap style we think looks best :) Great post as always! Thanks Ely! That sounds lovely... I'd love to see the pics afterwards!